March came in like a piglet and went out like a hog. Along the way, I knocked off some more piggy parts on my year-long quest to eat a whole pig. This month gave some good porcine chowing opportunities. This is another place that deserves it’s own post (some day). I went there for what my friends and I have creatively dubbed “Man Steak Club”. No, it’s not some bar in Chelsea, it’s an excuse for my friends and I to get together for a good steak once every couple of months. I’ve said too much. The first rule of Steak Club is that you don’t talk about Steak Club. Lugers is, hands down, my FAVORITE PLACE TO EAT A STEAK. It is a church of steak. After a long day of being omnipotent, this is where GOD goes for a rare dry-aged porterhouse and a scotch. So, you may ask, “Why are you writing about this temple of beef in a post about eating a pig?”. Because Lugers has the best appetizer for a hog hound like me. Simply put, it’s BACON. That’s all. Nothing more. You order it by the strip and it comes lonely on a large plate swimming in it’s own thick cut, fatty goodness. It is my favorite strip of bacon. 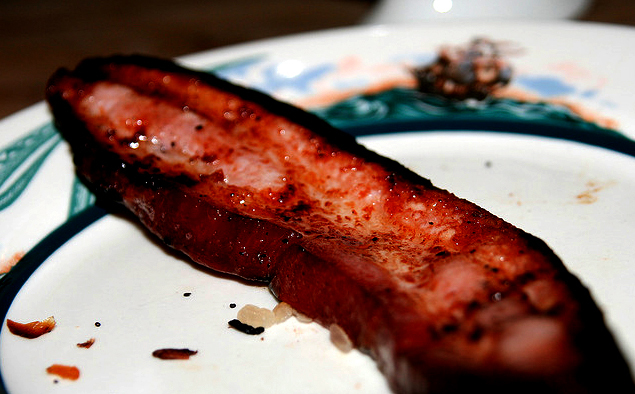 (Idea for new post: “Top 5 strips of bacon I have ever eaten”). Anyway, here’s a picture of it. I dare you not to lick your computer screen. Ladies and gentlemen, as of March 13th 2011, I have eaten a whole pig’s worth of ribs! This is actually not too surprising since there is virtually no meat on an individual rib, and I’ve been going to a lot of places that serve ribs. I have an odd feeling of accomplishment here. Now I can concentrate on other parts. Now that those ribs are out of the way, bring on the belly. The belly is a magical place. You can roast it, braise it, smoke it, make bacon, make pancetta, or just plain rub it for good luck. You’re going down, belly! Yeah, the ham is still posing a problem. I’m going to have to come up with a strategy. Any suggestions? 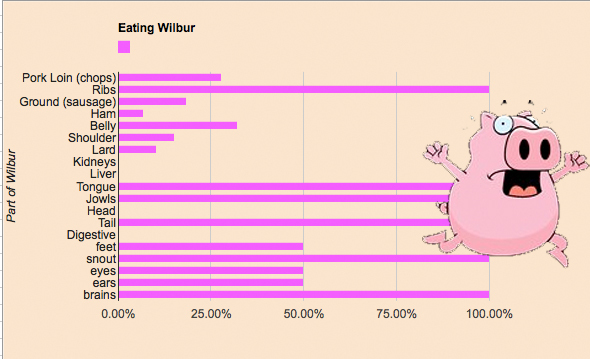 Do you feel that, Wilbur? That’s me breathing down your neck! April is here and that means… BASEBALL (Let’s Go Mets! )… which also means… BALLPARK FOOD! I fully anticipate upping my pig consumption by scarfing down some Mama’s of Corona heros at Citi Field this month. Mama’s makes one of the BEST Italian sandwiches in the borough. Play ball! I have never eaten at Lugers… I’m a disgrace to meat-kind. Next time you know that you’ll be in NYC a good month in advance, let me know and we’ll make plans to be carnivores! What???!!! How did I not invent that? Mrs. Notafoodie- I know my birthday was just last month, but come on…. That has “present” written all over it.